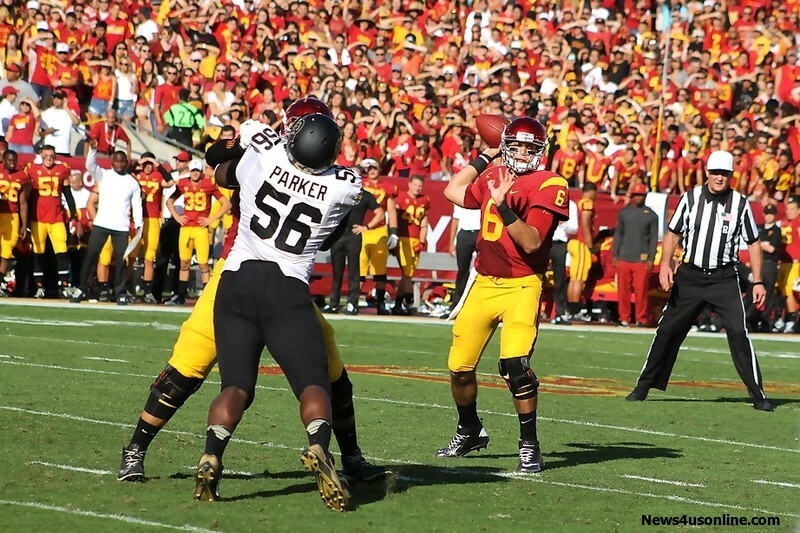 LOS ANGELES-It will be a a while before USC quarterback Cody Kessler forget what he accomplished Saturday afternoon against Pac-12 foe Colorado. To the delight of the Los Angeles Coliseum crowd and his teammates, Kessler set the painted Burgandy and Gold endzones on fire with seven touchdowns passes to break the school record that was once held by Matt Barkley. That in itself is a lot to digest. Oh, by the way, USC maintained its lead in the Pac-12 South Division with a 56-28 win against the Buffaloes in a game that wasn’t that close. But the big news of the day was Kessler and his on-fire performance. There have been plenty of great Men of Troy quarterbacks to come through the tunnel of the Los Angeles Coliseum, and none of them ever reached the plateau that Kessler reached with relative ease. There are a couple of guys currently playing in the NFL besides Barkley who never got to magic digit of (7). Arizona quarterback Carson Palmer won the coveted Heisman Trophy but never threw for seven touchdown passes in a game during his collegiate career. Philadelphia Eagles back-up Mark Sanchez had a a great ride when he was the Trojans signal-caller once upon a time. We can go down the line of heralded USC quarterbacks that done great things for the Trojans throughout the years, from Rodney Peete, Matt Leinart, current athletic director Pat Haden, Vince Evans and Paul McDonald, and yet it is Kessler who turns out to be the record-breaker of highest number of TDs thrown in a game. There are a lot of quarterbacks across the college football landscape getting a lot more attention that has been paid to Kessler this season. That should change after Kessler connected on touchdown throws of 16, 18, 7, 15, 9, 75 and 24 yards for his breakout game. For the record, Kessler went 19 for 26 on his passes for 319 yards through the air and his seven touchdown passes. That’s not a bad day at the office for a guy who have only thrown one interception on the season. With a lot of the attention in the Pac-12 going to expected Heisman Trophy candidates Brett Hundley of UCLA and Marcus Mariota of Oregon, Kessler has been lost in the media shuffle. His numbers certainly back up his play this season and should put him among the other elite passers in the college game. So far this season, Kessler has tossed 18 touchdown passes and have gone for 1, 884 yards through the air, and has his team on track to a possible Pac-12 title game invite should the Trojans make through the second half of their rugged schedule unscathed. Kessler and the Trojans still have to make a trip to Utah, play the always dangerous Cal and end the regular season against city rival UCLA and national scourge Notre Dame. But for now Kessler and the Trojans should savior their big day. Kessler started his onslaught on the school record books with a 16-yard hookup for a score with wide receiver Nelson Agholor. 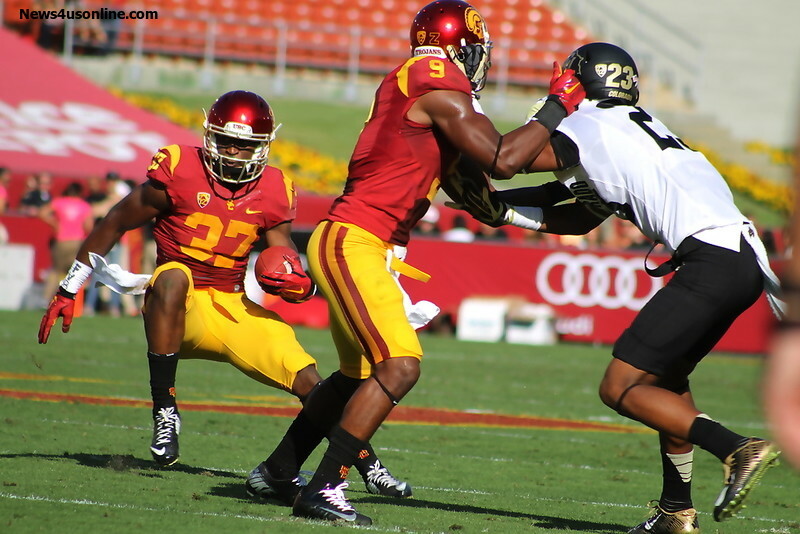 Kessler would then find the endzone three more times in the first quarter as USC built an insurmountable 28-0 lead. 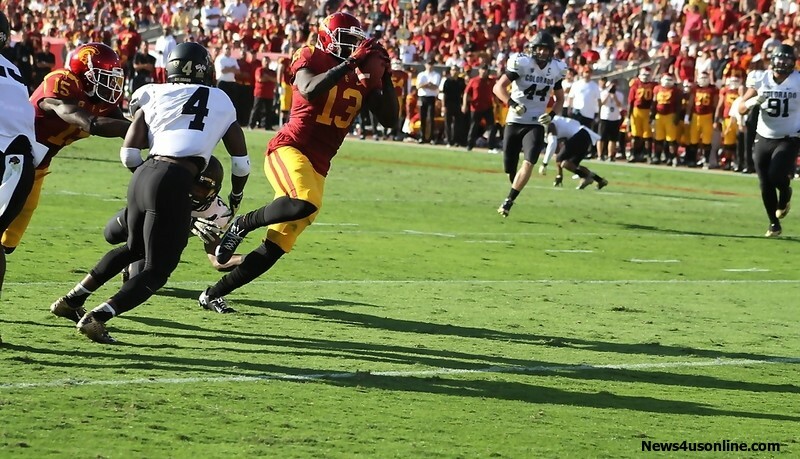 Kessler and Agholor struck again to open the third quarter, connecting for a 75-yard touchdown throw and catch. Kessler’s school-record touchdown came on a 24-yard pass to Steven Mitchell in the third period.